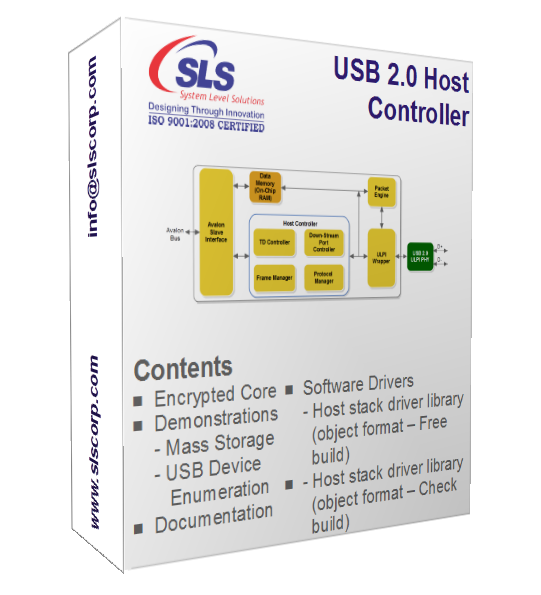 The USB 2.0 Host Controller IP Core is a 32-bit Avalon interface compliant core and supports ULPI interface. It supports High Speed (HS), Full Speed (FS) and Low Speed (LS) modes. IP core has been implemented in Verilog HDL and its functionality has been verified using different test cases in simulation environment as well as on hardware. It is provided as Altera Qsys Ready component and hence can be easily integrated in Qsys system. IP Core has been tested by interfacing it with USB 2.0 PHY (RN1133) on SLS HSIC development board. It has also been verified under simulation environment.